The Austin non-profit Parking Mobility argues that one in four cars parked in a disabled parking spot actually shouldn't be there, an abuse so common that law enforcement could never reasonably keep up with it. But while meter maids don't always spot these scofflaws, plenty of other people do (especially disabled drivers who are legitimately looking for such spots). So how do they get in on the shaming and ticketing? The app automatically adds GPS coordinates and a time stamp. 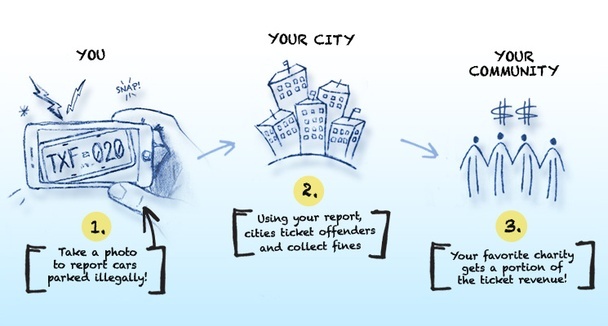 "After you take these photos," Parking Mobility's website adds, "leave the violating vehicle and submit the report. That’s it!" They do not, in other words, want you sticking around to give the illegal parker a piece of your mind. 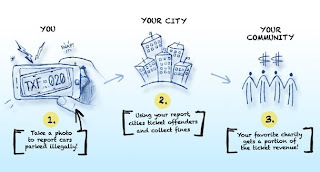 When the city collects the fine for the violation – as high as $500 in Texas, the Times reports – Parking Mobility would receive a portion to support the app and local charities. This is a cheap way to more efficiently enforce the most egregious parking violations, deputizing citizens in a limited way. The app is not built, however, to catch people who park in disabled parking spots with disabled placards but no actual disability.